It’s hard to miss it at night when it’s lit up in a bright red glow, and has been a staple in the North Side neighborhood for many years. 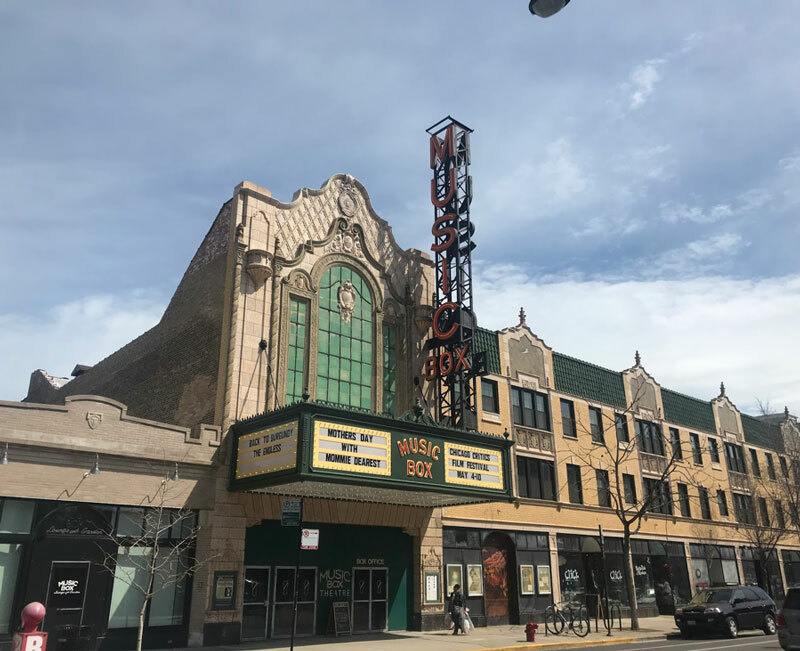 In a city full of many magnificent arts — music, dance, sculpture and acting — The Music Box stands out in Chicago’s fleet of historic theaters and auditoriums built in the late 1800s and early 1900s that still stand and operate today. Located just a few blocks north and west of Wrigley Field, and built nearly a century ago, The Music Box is widely considered one of the city's most historic places. Built in 1929, the theater was one of the first of its kind: a small capacity theater that was only able to show films (not live shows). The theater became known for its elaborate architecture and art. The theater ceiling has a “night sky” feel to it, with a dark blue paint and twinkling stars-almost makes the guest feel like they’re watching outside. The theater went on to become essential in growing the popularity of feature films among people for many years. In 1983, The Music Box began to show foreign and cult films, which have become a well-known feature of the theater. The Music Box labels itself “Chicago’s year-round film festival” which has stuck around since 1983. “We do classic matinees, midnight programming, events where directors come in and talk about their films,” Oestreich said. The theater originally had one main auditorium for films, however a second one was built in the early 1990s. The Music Box, while showing movies in the modern digital format, also is known to show classic movies in 35MM print. “Back in 2012 we decided we finally had to switch to a DCP Projector but we keep our analog projector because those classic films, while available on DCP, still had 35MM prints so because we like to show those classic films we would show them on 35MM,” Oestreich said. Something that makes Music Box unique compared to other theatres is its support of independent films and filmmakers. “Part of the fabric of art house is to show movies you can’t see…we are very happy to work with a filmmaker that has their own movie or work with a film festival that needs a venue,” Oestreich said. Matthew Gomez, who is involved with the project “Sellouts,” filmed a pilot for the show in The Music Box and also used the theater to premiere it for a live audience. The project was filmed in April 2017 and premiered on Sept. 3. “The Rocky Horror Picture Show” has been shown at the theatre since the midnight movies began, with another cult favorite, “The Room” becoming a regular screening in recent years. “The Room and Rocky definitely have their own built-in crowds that come every month. A portion of the crowds that come every month are regulars but others are regulars then the other ones are mixed in with coming infrequently or first timers,” Oestreich said.